Orlando Attractions near by including Walt Disney World’s Magic Kingdom! Camping at our Orlando RV Park. Walt Disney World Attractions (Magic Kingdom Park, Epcot, Disney Hollywood Studios, Disney’s Animal Kingdom Theme Park and Camp Disney) are all within close proximity to Kissimmee RV Park! Disney’s Water Parks, Disney’s Typhoon Lagoon Water Park and Disney’s Blizzard Beach Resort, and Sea World are also in close proximity to OUR Kissimmee campground! Wizarding World of Harry Potter…nearby! ESPN Wide World of Sports Complex…nearby! Universal Studios Florida, SeaWorld Orlando, Wet N’ Wild, Orange County Convention Center, Amway Center, Holyland Experience, Ripley’s Believe It or Not, and Historic Kissimmee…are all 30 minutes away! Kissimmee RV parks, RV Rentals, RV Campgrounds and RV Camping has never been so good! Kissimmee RV Park (formerly Orange Grove Campground & RV Park) centrally located and 6.5 miles from the peripheries of Disney World’s Magic Kingdom. Orlando attractions are generally within 30 minutes of our Kissimmee campground and RV park rental. Easy access from I-4 and the Florida Turnpike. There are 193 camping sites at this Orlando campground and RV park 34746. 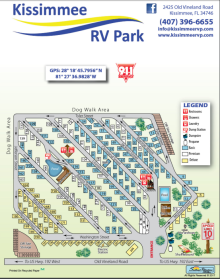 Kissimmee RV Park can meet all your camping and RV resort needs with sites for recreational vehicles, motor homes, campers and tents At Kissimmee RV Park, families, rallies and groups are welcome – we are pet friendly rv park too! We cater to seniors in the winter and families during the summer. Our amenities include a heated pool, recreation hall with kitchen and bingo, WiFi, shuffleboard courts, horseshoe pits, and clean restrooms and showers. Each Orlando camping site includes a concrete patio and a picnic table. Our recreation hall is perfect for bingo, potluck dinners and various gatherings during the winter months. This Florida property is a long block off of Hwy. 192 (West Irlo Bronson Memorial Highway) just minutes away Medieval Times, Old Town, dinner theaters, miniature golf, indoor flea markets, and major retail and employment centers. This RV Resort in Kissimmee is one you do not want to miss! Come create a lifetime of memories with us! 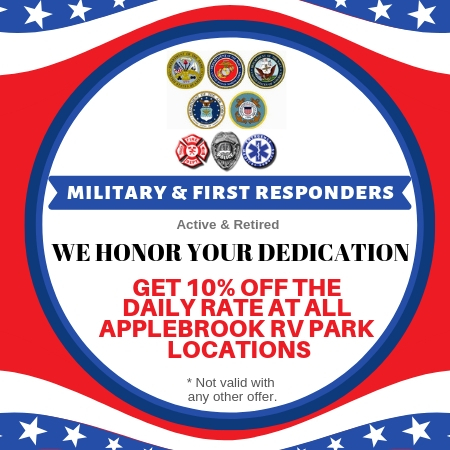 Kissimmee RV Park honors our brave military and first responder guests, active and retired, with a 10% discount on daily site rates.